For other places with the same name, see Mortlake (disambiguation). The Waterloo to Reading railway line runs through Mortlake, which has a pedestrianised riverside, two riverside pubs and a village green. The Boat Race finishes at Mortlake every March/April. 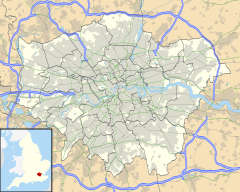 The Mortlake and Barnes Common ward of the London Borough of Richmond upon Thames has proved highly marginal. In the 2010 local elections local Liberal Democrats lost all three seats to local Conservatives, the latter forming an administration on Richmond Council. This remained the case until the 2018 local elections when the Liberal Democrats regained one of the three seats by a single vote. The Liberal Democrats also regained control of the Council. Richmond Park, the constituency which includes Mortlake, had changed from Liberal Democrat to Conservative in the 2010 general election, was recaptured by the Liberal Democrats in the 2016 by-election, and finally reverted to Conservative MP Zac Goldsmith in the 2017 general election by a margin of only 45 votes. The London Assembly constituency South West, which includes Mortlake, is represented by former local councillor Tony Arbour (Conservative). The place-name 'Mortlake' is first attested in the Domesday Book of 1086, where it appears as Mortelaga and Mortelage, a name with two possible derivations. If the second element is the Old English lacu meaning a stream, then the first element is very likely the fish-name mort meaning a young salmon, hence 'salmon stream'. If the second element is the dialect lag meaning a long, narrow marshy meadow, then the name means 'Morta's meadow'. Mortlake lay in the hundred of Brixton, which faded into obscurity. According to the Domesday Book, the manor and parish of Mortlage  was held by Archbishop Lanfranc of Canterbury when its assets were: 25 hides; 1 church, 2 mills worth £5, 1 fishery, 33 ploughs, 20 acres (81,000 m2) of meadow, wood worth 55 hogs. It rendered a large £38 plus 4s 4d from 17 houses in London, 2s 3d from houses in Southwark and £1 from tolls at Putney per year to its feudal system overlords. The manor belonged to the Archbishops of Canterbury until the time of Henry VIII, when it passed by exchange to the Crown. From the early part of the 17th century until after the English Civil War, Mortlake was celebrated for the manufacture of tapestry, founded during the reign of James I at the Mortlake Tapestry Works. Katherine Jenkins, classical singer, lives in Mortlake. 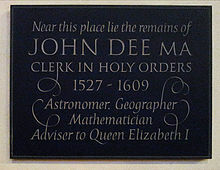 Mortlake's most famous former resident is John Dee (1527–1608/09), mathematician, astronomer, astrologer, alchemist and adviser to Queen Elizabeth I. He lived at Mortlake from 1565 to 1595 except for the six years between 1583 and 1589 when he was travelling in Europe. His house no longer exists but it became the Mortlake Tapestry Works and at the end of the 18th century was a girls' school. Sir Christopher Packe (1593?–1682), Lord Mayor of London, lived in Mortlake in about 1655–60. John Partridge (astrologer) (1644–c.1714) was born at East Sheen and apprenticed to a local shoemaker. He died in Mortlake and is buried there. The cemetery of St Mary Magdalen’s Roman Catholic Church Mortlake contains the tomb of the Victorian explorer and orientalist Sir Richard Burton. Former British Prime Minister Henry Addington who, as Lord Sidmouth, was Ranger of Richmond Park, and after whom the park's Sidmouth Plantation is named, is buried at St Mary the Virgin Mortlake. The town is mostly residential commuter town with a strong history of self-employed trades as it has traditionally centred its commerce on its foreshortened boundary, the Upper Richmond Road, arguably half part of East Sheen. Some businesses on the north side of the Upper Richmond Road make reference to the old ecclesiastical and ward boundaries supported by their still Mortlake side streets. East Sheen was once a manor in the parish of Mortlake and since early times an economic forum, and now a dining and convenience hub of the two districts. The Victoria County History's volume on Surrey, written from 1910 to 1912, does not list East Sheen as a parish, describes its detailed history under Mortlake and states the parish was "now connected with Barnes on one side and with New Richmond on the other". With the advent of motor transport, the buildings on Mortlake's winding high street, also known as the Lower Mortlake Road, have been mostly residential or used by the brewery. In 1889 the brewery was acquired by James Watney & Co., which in 1898 became Watney Combe & Reid after acquiring Messrs. Combe Delafield and Co. and Messrs. Reid and Co. When Watney's Stag Brewery in Victoria, London, was demolished in 1959, the name was 30 years later, applied to Mortlake Brewery. Being the last phase of The Boat Race which refers to all the traditional local names, it is still widely referred to as the Mortlake Brewery. The brewery became part of Scottish Courage, briefly part of Heineken and was then divested to Anheuser-Busch Europe Ltd as it produced the company's Budweiser pale lager. In January 2009, Anheuser-Busch InBev said that the company was proposing to close the Stag Brewery in 2010 as a result of a merger between InBev and Anheuser-Busch. In November 2015, it was announced that the site had been sold for £158m to Reselton – part of Singapore’s City Developments, which also bought the former Teddington Studios. The brewery closed in December 2015 and there are plans to build 850 apartments on the 22-acre location. The building next to Mortlake Railway Station, now occupied by a classic car showroom, contains Queen Victoria's old waiting room which was built for her and Prince Albert to use due to their frequent visits to White Lodge in Richmond Park where their family and latterly their son the Prince of Wales (later Edward VII) were living. These are minor stops on the Waterloo to Reading Line which has four branch lines: to Windsor Riverside station, to Weybridge and back to the London terminus via Kingston upon Thames or Brentford. This railway is a narrow bisector of the settlement, being generally on the flat with its streets, which tend to run perpendicular to it. It runs in the middle of Worple Way, separating it into north and south sides. To ensure that all the local authority wards have electorates of approximately the same size, the ward covering Mortlake also includes parts of Barnes. ^ "Election results for Mortlake and Barnes Common, 3 May 2018". 3 May 2018. Retrieved 10 May 2018. ^ Glaze, Ben (9 June 2017). "All the latest 2017 general election results and fallout as Tories lose seats". Daily Mirror. Archived from the original on 8 June 2017. ^ Ekwall, Eilert, The Concise Oxford Dictionary of English Place-names, p.331. ^ a b Lysons, Daniel (1792). "Mortlake". The Environs of London: volume 1: County of Surrey. British History Online. Retrieved 27 July 2013. ^ Brown, Maisie (1997). Barnes and Mortlake Past, with East Sheen. Historical Publications. p. 18. ISBN 0-948667-46-X. ^ Ambrose, Tom (31 December 2013). "Katherine Jenkins heads list of Richmond residents with honours". Richmond and Twickenham Times. Retrieved 21 January 2014. ^ "Dee's House". John Dee of Mortlake Society. Retrieved 17 December 2015. ^ a b "People of Mortlake, Barnes and East Sheen: M – S" (PDF). Barnes and Mortlake History Society. Retrieved 13 October 2012. ^ a b Historic England. "Mausoleum of Sir Richard and Lady Burton, Churchyard of St Mary Magdalen (1065392)". National Heritage List for England. Retrieved 2 November 2013. ^ "Henry Addington (1757–1844) First Viscount Sidmouth". Napoleon & Empire. Retrieved 18 October 2012. ^ "Stag to be first casualty of AB InBev merger". The Grocer. 10 January 2009. Retrieved 9 January 2016. ^ Ambrose, Tom (17 December 2015). "Historic Stag Brewery closes to make way for new "riverside quarter" including restaurants, shops and cafes". Richmond and Twickenham Times. Retrieved 17 December 2015. ^ Bourke, Joanna (27 November 2015). "Stag Brewery facing last orders as luxury flats move in". The Independent. Retrieved 29 November 2015.